Marcus Ulpius Nerva Traianus, commonly known as Trajan (September 18, 53 – August 9, 117) was Roman Emperor who reigned from 98, until his death in 117. He was the second of the Five Good Emperors of the Roman Empire. Born into a wealthy patrician family in the Hispania Baetica province, Trajan rose to prominence during the reign of Emperor Domitian, serving as a general in the Roman army along the German frontier. On September 18, 96, Domitian was succeeded by Marcus Cocceius Nerva, an old and childless senator who proved to be unpopular with the army. After a brief and tumultuous year in power, a revolt by members of the Praetorian Guard compelled him to adopt the more popular Trajan as his heir and successor. Nerva died on January 27, 98, and was succeeded by his adopted son without incident. As a civilian administrator, Trajan maintained good relations with the Roman Senate, and is known for his extensive public building program, which reshaped the city of Rome and left enduring landmarks. It was as a military commander however that Trajan celebrated his greatest triumphs. Under his rule, the Empire reached its greatest territorial extent. As an emperor, Trajan's legacy proved to be one of the most enduring in the history of the Roman Empire, and in reputation second only to that of Augustus. His reputation survived nearly undiminished for over nineteen centuries. Among medieval Christian theologians, Trajan was considered a virtuous pagan, while the eighteenth century historian Edward Gibbon popularized the notion of the Five Good Emperors, of which Trajan was the second. Trajan was the son of Marcia and Marcus Ulpius Traianus, a prominent senator and general from the famous gens Ulpia. The family had settled in southern Hispania (the Iberian Peninsula, comprising modern Spain and Portugal), in the province of Hispania Baetica in what is now Andalusia (in modern Spain), a thoroughly Romanized province. Trajan was one of many well-known Ulpii in a line that continued long after his own death. His elder sister was Ulpia Marciana and his niece was Salonina Matidia. Trajan was born on September 18, 53, in the city of Italica. As a young man, he rose through the ranks of the Roman army, serving in some of the most contentious parts of the Roman Empire's frontier. In 76–77, Trajan's father was Governor of Syria (Legatus pro praetore Syriae), where Trajan himself remained as Tribunus legionis. Trajan was nominated as Consul and brought Apollodorus of Damascus with him to Rome. He took part in the Emperor Domitian's wars along the Rhine River, and successfully crushed the revolt of Antonius Saturninus in 89. On September 18, 96, Domitian was succeeded by Marcus Cocceius Nerva, an old and childless senator who proved to be unpopular with the army. After a brief and tumultuous year in power, a revolt by members of the Praetorian Guard compelled him to adopt the more popular Trajan as his heir and successor. According to the Augustan History, it was the future Emperor Hadrian who brought word to Trajan of his adoption. When Nerva died on January 27, 98, the highly respected Trajan succeeded to the throne without incident. As issued by the Roman Senate, to the "Optimus Princeps" Trajan. The new emperor was greeted by the people of Rome with great enthusiasm, which he justified by governing well and without the bloodiness that had marked Domitian's reign. He freed many people who had been unjustly imprisoned by Domitian and returned a great deal of private property that Domitian had confiscated; a process begun by Nerva before his death. His became so popular that the Roman Senate eventually bestowed upon Trajan the honorific of optimus, meaning "the best." Dio Cassius, sometimes known as Cassius Dio, reported that Trajan drank heavily and was a pederast. "I know, of course, that he was devoted to boys and to wine, but if he had ever committed or endured any base or wicked deed as the result of this, he would have incurred censure; as it was, however, he drank all the wine he wanted, yet remained sober, and in his relation with boys he harmed no one" (Dio Cassius, Epitome of Book LXVIII; 6.4). On one occasion, he favored the king of Edessa out of appreciation for his handsome son: "On this occasion, however, Abgarus, induced partly by the persuasions of his son Arbandes, who was handsome and in the pride of youth and therefore in favor with Trajan, and partly by his fear of the latter's presence, he met him on the road, made his apologies and obtained pardon, for he had a powerful intercessor in the boy" (ibid. 21.2–3). Trajan is best known to history as a military commander. Domitian had campaigned against Dacia from 85 to 89, without securing a decisive outcome, and Decebalus had brazenly flouted the terms of the peace which had been agreed on conclusion of this campaign. In 101, Trajan launched a punitive expedition into the kingdom of Dacia, on the northern bank of the Danube River, defeating the Dacian army near Tapae. During the following winter, Decebalus launched a counter-attack across the Danube further downstream, but this was repulsed. Trajan's army advanced further into Dacian territory and forced King Decebalus to submit to him a year later, after Trajan took the Dacian capital of Sarmizegethusa. Trajan returned to Rome in triumph and was granted the title Dacicus Maximus. 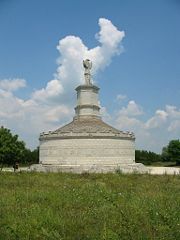 The victory was celebrated by construction of the Tropaeum Traiani in Moesia Inferior. In 105, Decebalus undertook an invasion against Roman territory by attempting to stir up tribes north of the river against her. Trajan took to the field again, after building his massive bridge over the Danube, using the design of Apollodorus of Damascus. Unlike the first conflict, the second war involved several skirmishes that proved costly to the Roman military, who, facing large numbers of allied tribes, struggled to attain a decisive victory. Trajan’s forces conquered Dacia completely in 106. An assault against the capital Sarmisegetusa took place at the beginning of the summer of 106. The Dacians repelled the first attack, but the Romans destroyed the water pipes to the Dacian capital. The city was burned to the ground, Decebalus committed suicide, and his severed head was exhibited in Rome on the steps leading up to the Capitol. A Dacian traitor, Bicilis, a confidant of the Dacian king, told the Romans where to find Decebalus's treasure in the river of Sargesia/Sargetia, a fortune estimated by Jerome Carcopino at 165,500 kg of gold and 331,000 kg of silver. The Dacian Wars were a huge triumph for Rome and its armies. Trajan announced a total of 123 days of glorious celebrations throughout the Empire. Dacia's rich gold mines were secured, which provided a source of finance for Rome's future campaigns and assisted the rapid expansion of Roman towns throughout Europe. One hundred thousand male slaves were sent back to Rome. Trajan built a new city, "Colonia Ulpia Traiana Augusta Dacica Sarmizegethusa," on another site, but it still bore the name Sarmizegethusa. To discourage future revolts, Legio XIII Gemina and Legio V Macedonica were permanently posted in Dacia; the veterans of these legions were given land in Dacia and married Dacian women, leading to the birth of the Romanian language. The conquered half (southern) of Dacia was annexed, becoming a province, while the northern part remained free but never formed a state. This victory was celebrated by erecting Trajan's Column. Denarius issued by Trajan to celebrate the winning of the Dacian Wars. Front. Text: IMP TRAIANO AVG GER DAC PM TR P COS V PP. Image: Laureate head right; the legend abbreviates as Imperator. Trajan. Augustus. Germanicus. Dacicus. Pontifex Maximus. Tribuniciae Potestate. Consul V. Pater Patriae. Reverse. Text: SPQR OPTIMO PRINCIPI. Image: Dacian soldier wearing the Dacian peaked cap, seated on shield in mourning, with the curbed Dacian Falx (sabre) below. The reverse abbreviates Senatus Populus Que Romanus. Optimo Principi. 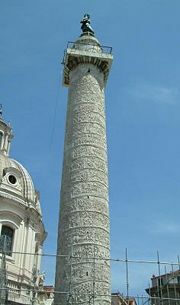 Trajan was notorious for the length of his inscriptions, which are the longest of the imperial series. Here, the titles actually form a continuum on both sides of the coin. It all translates as "Imperator, Trajan the Augustus, victor over the Germans and Dacians, chief priest, with the power of a tribune, consul for the fifth time, father of his country, the Senate and People of Rome: best of emperors." ---RIC II 219, BMC 175, RSC 529. Coin showing the Forum of Trajan. At about the same time, one of Rome's client kings, the last king of Nabatea, Rabbel II Soter, died. This might have prompted Trajan's annexation of Nabatea, although the reasons for annexation are not known, nor is the exact manner of annexation. Some epigraphic evidence suggests a military operation, with forces from Syria and Egypt. By 107, Roman legions were stationed in the area around Petra and Bostra, as is shown by a papyrus found in Egypt. The Empire gained what became the province of Arabia Petraea (modern southern Jordan and north west Saudi Arabia). For the next seven years, Trajan ruled as a civilian emperor, with the same popularity as before. During this time, he corresponded with Pliny the Younger on the subject of how to deal with the Christians of Pontus, telling Pliny to leave them alone unless they were openly practicing the religion. He built several new buildings, monuments, and roads in Italia and his native Hispania. The magnificent complex in Rome raised to commemorate his victories in Dacia, largely financed by loot from that campaign and consisting of a forum, Trajan's Column, and a shopping center, still stands in Rome today. He was also a a prolific builder of triumphal arches, many of which survive, and re-builder of roads (Via Traiana and Via Traiana Nova). One notable event was Trajan’s hosting of a three-month gladiatorial festival in the great Colosseum, in Rome, the precise date of which is unknown. Combining chariot racing, beast fights, and gladiatorial combat at close quarters, the gory spectacle reputedly left 11,000 dead, mostly slaves and criminals, with thousands of ferocious beasts killed alongside them, and attracted a total of five million spectators over the course of the festival. Roman Empire in 116, at its maximum extent. In 113, he embarked on his last campaign, provoked by Parthia's decision to put an unacceptable king on the throne of Armenia, a kingdom over which the two great empires had shared hegemony since the time of Nero some fifty years earlier. Trajan marched first on Armenia, deposed the king and annexed it to the Roman Empire. Then, he turned south into Parthia itself, taking the cities of Babylon, Seleucia, and finally the capital of Ctesiphon, in 116. He continued southward to the Persian Gulf, where he declared Mesopotamia a new province of the Empire and lamented that he was too old to follow in the steps of Alexander the Great. Later in 116, he captured the great city of Susa. He deposed the Parthian king Osroes I and put his own puppet ruler, Parthamaspates, on the throne. Never again would the Roman Empire advance so far to the east. At this point Trajan met with a setback. The fortress city of Hatra, on the Tigris in his rear, continued to hold out against repeated Roman assaults. Trajan was present in person at the siege and it is possible that he suffered a heat stroke in the blazing temperatures. The Jews inside the Roman Empire once more rose up in rebellion, as did the people of Mesopotamia. Trajan was forced to withdraw his army in order to put down the revolts. Trajan saw it as simply a temporary delay in his plans, but he was destined never to command an army in the field again, turning his Eastern armies over to the high-ranking legate and governor of Judaea, Brinius Carnix Maximus. Late in 116, Trajan grew ill and set out to sail back to Italy. His health declined throughout the spring and summer of 117, and after reaching Selinus in Cilicia, which was afterwards called Trajanopolis, he suddenly died from edema on August 9. Some say that Trajan had adopted his first cousin once removed, Publius Aelius Hadrianus—commonly known as Hadrian—as his successor; others claim that his wife Pompeia Plotina hired someone to impersonate him after he had died and declare Hadrian’s succession. He was deified by the Senate and his ashes were laid to rest in the Mausoleum of Augustus. Eugène Delacroix. The Justice of Trajan (fragment). Hadrian, upon becoming ruler, returned Mesopotamia to Parthian rule. However, all the other territories conquered by Trajan were retained. For the remainder of the history of the Roman Empire and well into the era of the Byzantine Empire, every new emperor after Trajan was honored by the Senate with the prayer felicior Augusto, melior Traiano, meaning "may he be luckier than Augustus and better than Trajan." 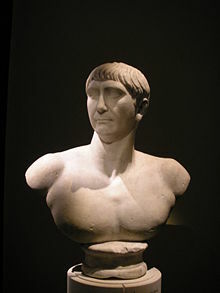 Unlike many rulers in history, Trajan's reputation has survived undiminished for nearly nineteen centuries. The Christianization of Rome resulted in further embellishment of his legend: It was commonly said in medieval times that Pope Gregory I, through divine intercession, resurrected Trajan from the dead and baptized him into the Christian faith. An account of this features in the Golden Legend. Theologians such as Thomas Aquinas discussed Trajan as an example of a virtuous pagan. In The Divine Comedy, Dante, following this legend, sees the spirit of Trajan in the Heaven of Jupiter with other historical and mythological persons noted for their justice. He also features in Piers Plowman. 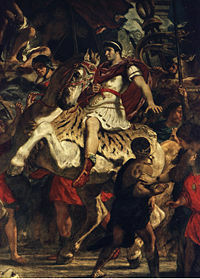 An episode, referred to as the Justice of Trajan, was reflected in several art works. ↑ Augustan History, Life of Hadrian 2.5–6. Retrieved November 16, 2007. Ancell, R. Manning. 2001. "Soldiers." In Military Heritage. Volume 3, No. 3: 12, 14, 16, 20. Fuller, J.F.C. 1987. A Military History of the Western World. New York: Da Capo Press, Inc.
Lepper, F.A. 1948. Trajan's Parthian War. London: Oxford University Press. Herbert W. Benario, Trajan (A.D. 98-117), Emory UniversityAn Online Encyclopedia of Roman Emperors. This page was last modified on 29 July 2013, at 13:52.